Vicki Richmond, our Kansas City Coordinator, will be receiving her second big honor of the year. 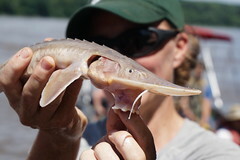 The Missouri Department of Conservation has named her one of the 2007 Master Conservationists. In addition to her work on the Missouri River, Vicki has been working for over 15 years on stream projects in the Kansas City area, especially with the Blue and Little Blue River Watersheds. River Relief is excited to be participating in the Americorps Stream Team Assistant Program this year. We’ve hired one of our volunteer crewmembers, Melanie Cheney. She will be helping us and other area Stream Teams. On Sept. 20, MRR crewmembers Jeff Barrow and Melanie Cheney accepted the William T. Schock “Clean Water Conservancy” award at the Open Space Council’s Meremec Basin Summit. The award recognizes MRR’s commitment to water conservation across the state, and is a beautiful print of the pre-settlement St. Alban’s bluffs by artist Bryan Dawes Haynes.